Our top 4 post was Kentucky Ice Storm 2009. Here’s how this winter compares to the winter of five years ago. This is what my front yard looked like on the morning of January 28, 2009. The branch in front of my porch was brought down by the weight of ice that encased the tree. This is the view of my driveway on the morning of January 28, 2009. This young tree was tipped over from the weight of the ice on the branches. 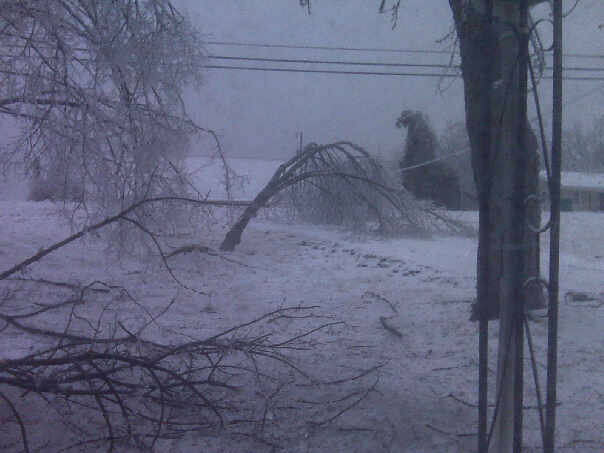 It’s been five years since the Ice Storm of 2009. Lately, there has been a lot of talk about it because of the weather we’ve been having. So many people I know have complained about the weather – 70’s one day, 20’s the next day, rain another day, and snow another day. If only they could remember a time when we were in worse shape, perhaps they could see how blessed we have been. One of the first snow storms we have had this year brought along some ice. It reminded me of the ice storm when ice encased trees, bushes, and cars. Despite icy conditions, it was beautiful to behold as the landscape glistened in the sun. Unlike the Ice Storm of 2009, Kentucky did not lose power for six weeks this time around. I didn’t require a hammer to chisel my Jeep out of an ice capsule. So in retrospect, we’ve had a mild winter. In 2009, I was still in the Kentucky National Guard. The state called all units to active duty and I spent two weeks working in the emergency response center in Glasgow, KY. Units were out clearing roads, using chainsaws to remove trees. Others went door-to-door in remote areas of the state checking in on people to verify their safety. Now that I work at the animal shelter, I have heard stories about how the ice storm impacted the shelter five years ago. The staff had to care for animals without power or heat. One of my coworkers described cleaning kennels by flashlight. One held a flashlight while the other cleaned. I can’t imagine how difficult this must have been. Thankfully, we have not been in a state of emergency this winter. How do you remember the Ice Storm?